The mTOR pathway. Both environmental cues and signal mediated by growth factors impact on the mTOR pathway, which positively regulates cell growth and neurogenesis. Mutation in STRADA coding for the TE20-related kinase adaptor alpha eventually lead to a reduced activity of TSC1/TSC2, which, in turn, leads to increased mTOR activation. 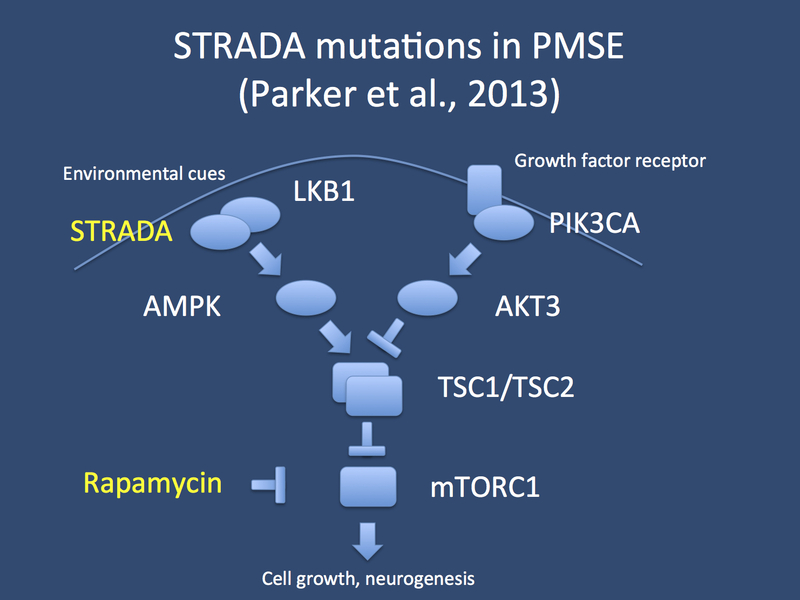 Mutation in STRADA cause polyhydramnios, megalencephaly and symptomatic epilepsy syndrome (PMSE). In the current paper, Parker and colleagues demonstrate that application of sirolimus (rapamycin) can lead to a drastic reduction in seizure frequency in PMSE.